Is a mini-book still a book? Because Penguin put out this line of “modern classic” mini-books, and they are making me swoon. (I can’t find the mini-books on their site though, and if I didn’t have two of them on hand, I would wonder if it had all been a dream.) All uniformly sleek and silver, they are a little bite of a book for that modern urbanite on the go. (Is that sentence the result of too many advert soundbites getting into my poor brain?) And even though my floor is threatening to buckle under the stack of books waiting to challenge my brain, I could not resist the temptation of a bite-sized bit of D.H. Lawrence. Oh David! His words resonate with me like I am his harp. I can’t explain it. Ever since I read Women In Love, he owned me. I’ve read and re-read his work to the point where pages fall out, but it never fails to stir something in me. I can’t quite understand this since he writes about so many things so far from my own experience, and often quite irritating to me. Like his compulsive and florid descriptions of the English countryside, the mining towns. I have rolled my eyes at these more than once; I can understand the Lawrence haters. But then you get lines like “‘There are odd moments when I hate you starrily’” and all is forgiven. 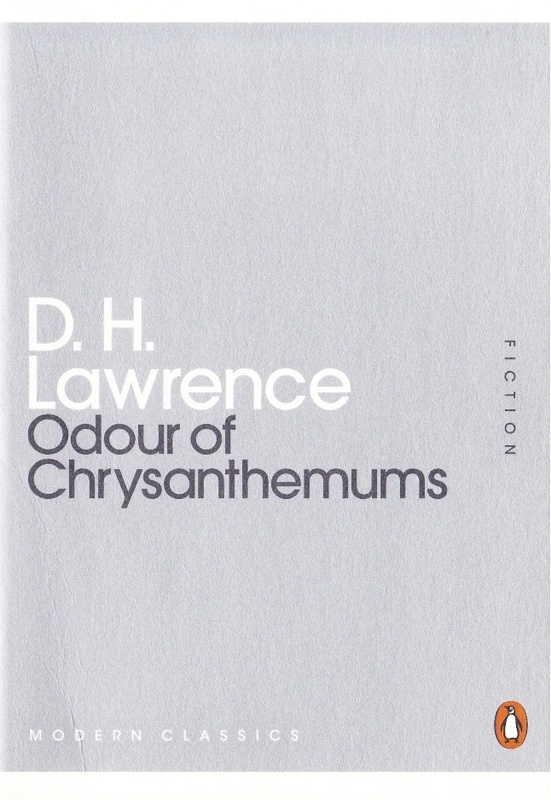 Odour of Chrysanthemums offers up two of Lawrence’s short stories, the one that lends its title to the mini-book and “The Blind Man”. Both feature that moment of existential angst that any reader of Lawrence has come to expect, the moment where the character wonders at her or his relationship with another character, and where that relationship fits into the grander scheme of their lives. In “Odour”, the wife of a miner waits anxiously for her husband to come home, while in “Blind”, a blind man wonders at the nature of his relationship with his wife and her relationship with a relative. It might be exactly this that I love about Lawrence, his focus on relationships between people and how perspective and context can change everything (my personal obsessions). I don’t want to reveal too many details since the stories are short, and the reveals are kind of important in the flow of things. But the details are not really the essential part. The facts, the story itself, these are secondary to the characters’ reactions, how they feel, how they integrate the new events into their understanding of the world. Like Elizabeth, the miner’s wife. When he husband is late and she is talking with her mother-in-law, she worries about her children: “At any rate, she was absolutely necessary for them. They were her business.” She recognizes and owns her responsibilities so clearly, so solidly, despite whatever else is going on. Lawrence has a way of making the ordinary extraordinary and beautiful, a precise languidness that, by now, makes me feel like I’m coming home to warm hugs after a long trip. It’s impossible for me to be neutral reading any of his work after spending so much of my life in love with his words. So grain of salt here! That said, if you don’t have everything he’s ever written on your bookshelf (I’ve read his psychoanalysis book, so you know, you don’t have to listen to me) (that book was weird and not in a good way), this mini-book is a very good introduction to all the things that make me love him.